This model has been discontinued. It has been replaced with the latest model, “LOS-NT/NTW Series “. Maintenance parts for the large-packaging food sealer machine FiL-NT/NTW model are still available. NT – Vacuum Pump. NTW – Ejector Vacuum. Seals securely with Fuji Impulse sequence control system. The commercial food sealer features vacuum sealing/vacuum and gas flushing sealing to prevent oxidation and deterioration of the precision parts. 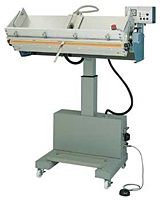 FIL-1000NTW series (ejector vacuum) conducts vacuuming through the use of an ejector, powered by the compressed air. Ejector vacuum sealers are effective for vacuum packaging liquid and powder contents, and for shortening the time required for vacuuming. Although time required is shorter than for vacuum pumping (FiL-NT Series), using the ejector vacuuming results in a lower ultimate vacuum.